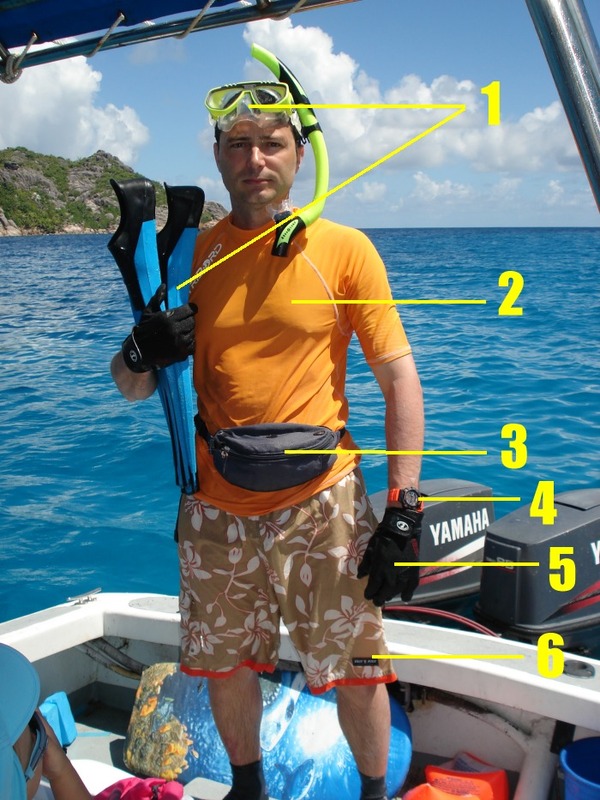 1- Classic snorkeling equipment. Always use the best one. 2- Shirt (anti-UV and dry fast one) : first of all to protect from sun and also against injuries. you can wear a 3mm diving suit of course ! Try to wear a bright colored shirt in order to seen by speed boats. If you have to swim in a shark environment area, you shall wear dark or bleu shirt as bright one like orange-yellow-red may interest them more (it's proved), though you will be less visible for speed boats… it's a choice. Note that neopren wears are the best against shark predation as you "smell" will be reduced a lot (it's proved), use also neopren gloves and socks. 3- One of the most important thing : bumbag (fanny pack). 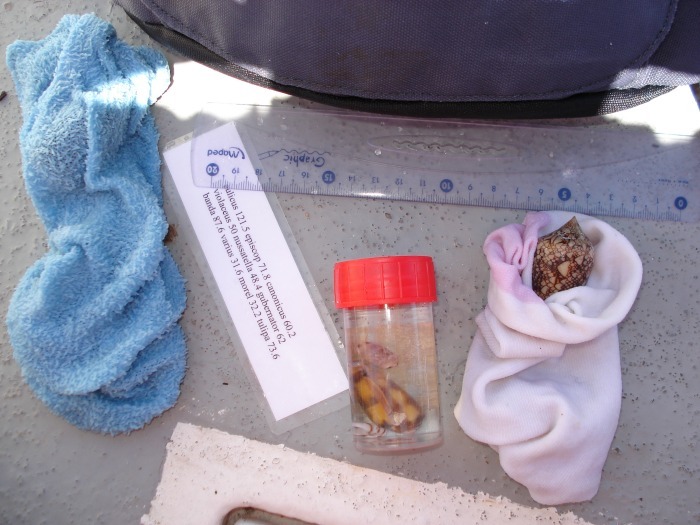 Always avoid plastic bag as stings of cone shells can hit you. Inside you can place many tools. 4- Watch : always give to someone the time you'll be gone, just in case… your hobby can sometimes make you loose the "meaning of time"…..
5- Gloves : as important as the bumbag, this will be inevitable if you want to flip dead coral plates manually. 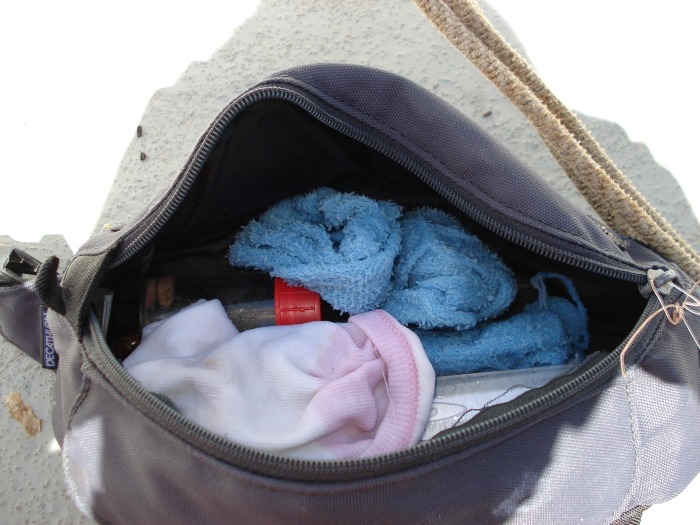 The bumbag (fanny pack) is one of the best way of keeping your shells. – A list of shells and their maximum sizes (to avoid of killing molluscs if I have already bigger at home). – Several socks : they are the best way of keeping fragile shells such as cone shells and that way I have never broken any lip !